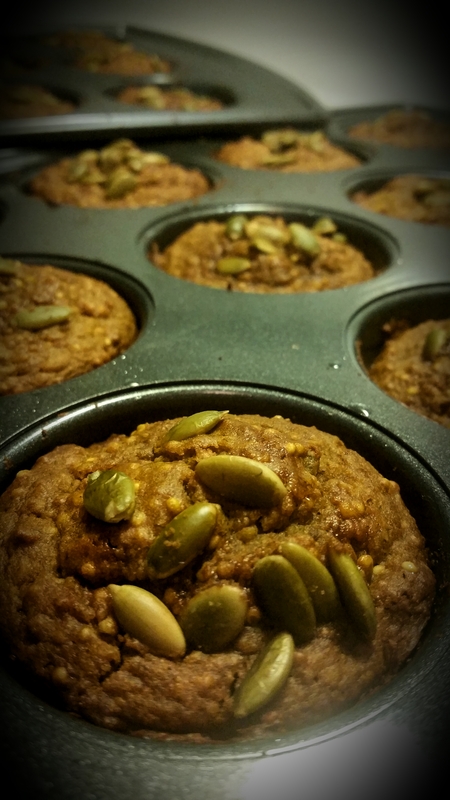 Here is my new healthier version of a very Fall favourite muffin. Millet and Pumpkin go so well together and with all the spices and lightly sweet coconut sugar these muffins are the perfect chilly morning with tea kind of treat. I chose to use half almond flour and half prepared gluten free flour mix but you could go all almond flour or go the other way and swap out the almond flour completely to make these nut free (omit the pumpkin seeds too then of course). Might change the baking time slightly but just keep an eye on them as they near the 25 minute mark. You could also use organic wheat flour if you wish. I use a full fat Greek goat yogurt here but you could use a dairy version or even buttermilk if you wish but do your body a favour and stay with organic and do not try to use a light yogourt. Only other ingredient detail to mention I think would be the cranberries, I only have juice sweetened cranberries in my kitchen, if you haven’t tried them yet I suggest you do, they are SO much tastier and better for you than the oiled sugar, sulphonated ones. Whole Foods carries them in bulk or every health food store should stock them. Pumpkin seeds can be purchased already toasted but to toast the millet, heat on medium high in a pan, shaking often until you hear them start to crackle and pop then remove. This recipe makes two dozen smaller muffins, filling the cups almost ¾ full but you can fill a one dozen pan to make 12 larger ones. Beat Eggs with Oil, Yogourt, Coconut Sugar and Vanilla. I use a food processor but you can hand mix if you like. Add remaining ingredients and mix or process well. Spoon into greased or lined muffin pan then sprinkle with coconut sugar and a few more pumpkin seeds.